Commission based on Siwan (Joan/Joana) daughter of King John and wife of Llewelyn ap Iorwerth (the Great). She lived in the various courts belonging to this prince of Gwynedd and was buried in Llanfaes, near Beaumaris, where a friary was built in her memory. Her coffin, with her image carved on the lid, is in the porch of St Mary’s church in Beaumaris. ‘Breila’ is an old Welsh word for wild rose. Cotton fabrics, machine pieced then hand and machine quilted and hand beaded. 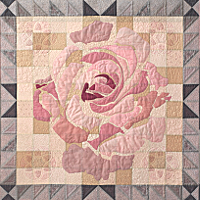 This entry was posted in Portfolio and tagged Beaded, Contemporary, Cotton, Free Machine Quilted, Hand quilted, Machine piecing, Private collection on 30 April, 2013 by admin. Cotton fabrics, pieced in colours reminiscent of a hot foreign summer with geckos and wind blown flowers continuing the theme. Machine quilted and hand beaded. 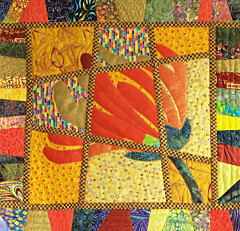 This quilt won first place in the Large Wall-hanging section of the Scottish National Quilt Championships. 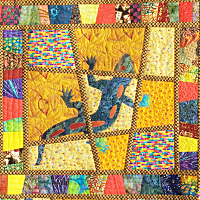 This entry was posted in Portfolio and tagged Award winner, Beading, Contemporary, Cotton, Machine quilted, Private collection on 30 April, 2013 by admin.